Jonathan is a professional dance artist, movement director and choreographer who has worked for many major British dance companies including, Richard Alston Dance Company, Scottish Dance Theatre and Rambert Dance Company. In 2013 Jonathan took the title role of Mark Bruce Company’s production of Dracula, which received the South Bank Show Sky Arts Award for Dance. 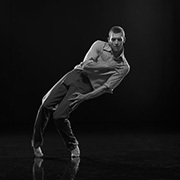 In 2007 he was the first contemporary dancer to be nominated in the dance category of the South Bank Show /Times Newspaper Breakthrough Award, in 2008 he was nominated for an Olivier Award for Outstanding Achievement in Dance and went on to become the first contemporary dancer to win the Critics Circle National Dance Award for Best Male Dancer. The Critics Circle nominated him twice further as Best Male Dancer in 2011, 2012 before Jonathan went onto win Outstanding Male Performance (modern) and Best Male Dancer awards in 2014. In 2008 Jonathan founded an education project Dancespinner: a tool which is now being used by over 200 UK schools to explore and create choreography. Since leaving Rambert in 2012, Jonathan has become a part time tutor at the Architectural Association and is founder member of both New Movement Collective and Goddard Nixon – an acclaimed choreographic collaboration with fellow ex- Rambert dancer Gemma Nixon. As a Movement Director he has worked for the National Theatre on productions of Strange Interlude, Man and Superman and upcoming Beaux Stratagem, the Royal Shakespeare Company on Two Gentlemen on Verona and as dance associate on Sam Mendes’ Charlie and the Chocolate Factory.